A friend who roams far and wide every day of the week, mentioned he’d met an interesting woman in Somerset East. “She fixes up tortoises that have been hit by vehicles,” he explained. We pounced on the contact details he gave us. If we couldn’t save the Paterson tortoise, then at least we could put the word out so that others might be rescued. 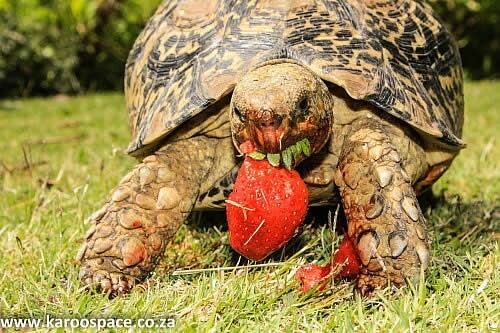 We owed the tortoise nation that much at least. 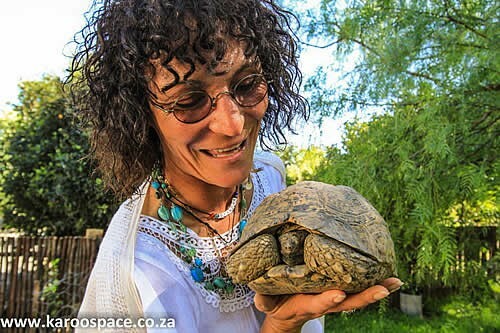 Gia de Goede, the tortoise lady in question, used to live in Hermanus but moved to Somerset East with her husband Andre in 2012. It was in Hermanus that Gia joined the Animal Welfare Society and immersed herself in the saving of all four-legged beasties. This was where she learnt that a tortoise shell can heal. She worked out a way of covering the open parts with disinfected gauze or netting and creating a new ‘shell’ with Plaster of Paris or even Pratley putty. The tortoise shell uses the new matrix to regrow. Within a year or two, you’d hardly realise how badly a shell had been injured. Andre and Gia’s house in Paulet Street is full of animals. There are five dogs, seven cats, two naughty pigs and at least seven tortoises (with the requisite permits). Some have been injured and fixed up, while others are simply too small to survive the Karoo’s pied crows, which have learnt to crack open their shells by flying up in the air and dropping them. 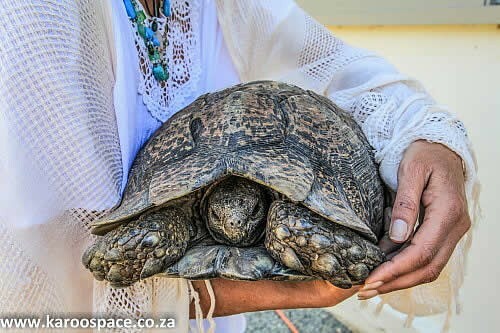 Five other tortoises were recently been released onto a nearby farm. These reptiles love Gia’s garden so much that they are mating and one has even laid eggs in the vegetable patch. Gia de Goede can be reached on cell phone number 083 226 0511 or giadegoede@gmail.com. 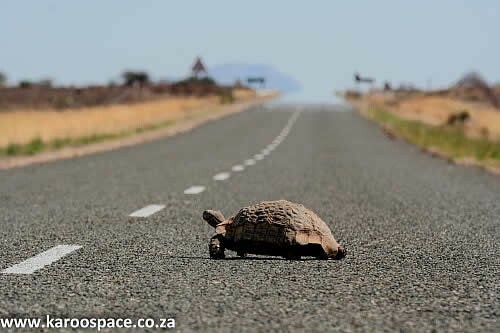 The Endangered Wildlife Trust (EWT) has an initiative called The Wildlife and Roads Project, which needs volunteers to help identify the roadkill hotspots of South Africa.